Garry and Lois Allen were friends of Doc’s since his early days. They lived in Wilcox where Garry farmed south of the town and Lois was a teacher at the Public Elementary School. They moved from Wilcox to Regina in 1969. Garry drove back and forth to Wilcox to farm and Lois continued to teach at elementary schools in Regina. We didn’t see much of them until they moved to the city. Garry was the first male consummate shopper that we knew. He was always going to see cars, trucks, farm equipment and not necessarily buying anything. Garry attended many an auction sale but I don’t think Doc was along for many of those occasions. Sometimes Doc would go with him on these “wild goose chase” as we called them! Garry even became the proud owner of two different Mini’s. Of course that meant he was at our place quite often engaging in “Mini” repairs or talk. Garry would phone our place almost every night at 6:00 p.m. and the first thing he asked Doc was, “what are you having for dinner tonight?” Doc always said, “Fried bologna.” (Really he said, “Fried baloney because that’s how we said the word bologna). They always had long conversations and Garry had all the news! Lois was always a classy lady. She was teaching at Grant Road School when the school board bussed mentally challenged kids from all over Regina to her school for the Kindergarten Class. There were no teacher aide’s at that time and nobody had training to deal with these kids. I recall one girl that came to Lois’s class and screamed the whole day. (Those of us who were never teachers had no idea the things they had to contend with! Teachers deserve huge thanks for the work they do.) Lois traveled to many countries, sometimes with other teachers, in the summer months when there was no school. Lois remembers one Sunday when they went out to the Sports Car Club Ice Racing event south east of Regina and Doug Reimche raced Garry’s Mini. How exciting to see the Mini come in First Place. On March 31,1981 Garry, Lois, Doc and I drove to Billings, MT after work on the Friday evening. We went shopping on Saturday morning because Garry wanted a new jacket. He found a London Fog jacket and we boarded a Continental Airways flight to San Antonio. Garry had been to Canyon Lake outside San Antonio several times. The area was being developed by a group of people from Regina. There were about 40 people from Regina on this trip. The cottage at Canyon Lake is partially finished in this picture. Garry had bought a lot and the cottage was being built on the site. We went downstairs to the restaurant and had dinner. We went back upstairs and Garry realized that he had forgotten to take his jacket with him to our rooms. He immediately went back to the restaurant and the jacket was nowhere to be found! On Sunday we went out to Canyon Lake where the Woodlands Golf Course was being built. We, along with about a hundred other people, had a delicious brunch at the dining room of the club house. I remember that the clubhouse had been built to the tune of Five Million Dollars. It was truly beautiful and the brunch was delicious. One of the mansions Lois and I toured. Lois, Doc and Garry – Dinner at the Bayous – I took the picture! Bayous restaurant overlooking the River Walk. All our food was fabulous. Lois and I both had the Seafood platter and it was so good. One night the group we came down with were all heading to New Braunsfeld. Doc and I were not interested in going for German food so we drove over to a nearby store for some Coke’s. The young couple had just opened the store a few weeks ago and were watching curling from Canada on their satellite dish. They didn’t have a liquor license yet but asked us if we would join them with a drink of Scotch and we said we’d love to. We spent about an hour visiting with them. They had been following the curling and were so excited about the sport. They said they were going to go to Canada and try curling. Plentywood, MT in our motorhome. What a hoot that was! 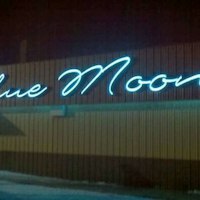 Of course we went for dinner and/or dancing at the Blue Moon. Not much dancing anymore but the food was good.